Behind every Personal Training Business is a set of numbers. In this article take a close look at what those numbers mean and how they can be changed in any PT Business. After two decades of working in and around the Personal Training Business I'm still amazed at how much the fundamentals apply. I'm never that surprised when a Personal Trainer comments 'my PT business has just taken off lately - I just got all the little things sorted and away it went!' In this article we'll be looking closely at the fundamentals of business and then PT businesses to discover exactly what those 'little things' are and how to 'get them sorted'! Firstly, although this could be accepted as excessively obvious, let's define what a business actually is. A business is an organization that charges a customer for the delivery of a product, service or experience with the primary aim that the price charged to the customer exceeds the expenses of the organization thereby leaving a profit. Businesses usually require some capital (initial funding) to start and will usually trade at a net loss for a period of time before turning a profit. The set up capital (covering costs related to opening the business for trade) and trading capital (to fund the initial losses where expenses may be incurred before sufficient sales are made) are generally paid back to the shareholders in the business once profits are realised. In order to 'lose your shirt' in a business the business must fail to repay some or all of the capital invested by the shareholders (the owner(s) of the business). Commercially it could be argued that a business that delivers the highest possible value to the customer at the highest possible charge (price) to customers whilst having the lowest operating cost possible is the most profitable or successful financially. This can be seen in a business's 'margins' being the profit in the business expressed as a percentage of the total income. The higher the margin in a business it could be argued the better that business is doing within the competitive setting at satisfying its customers at the lowest cost possible. A business whose customers report high satisfaction, refer others, buy goods or services at a high margin from the business, or buy repeatedly from the same business create the 'good will' within a business. Goodwill is defined as the value of a business over and above its tangible assets (these are assets you can see such as vehicles, equipment, buildings etc). Therefore goodwill is usually listed as an intangible asset as it can not be seen but contributes to the overall value of the business. A better business has more goodwill and therefore is likely to have more longevity as its customers have a history of satisfaction and openness to the business's offerings. A business that is well organized delivers value more consistently and with greater efficiency. As a result the margins will likely be greater and the goodwill higher. The effect of customer satisfaction and a business's consistency and efficiency is an increase in longevity. The usual goal of most businesses is to be highly efficient, consistent, profitable and long lasting thereby giving the shareholders of that business the greatest returns on initial capital invested over time. A business that is fully 'systemized' is, provided the systems create the desired results efficiently, more predictable in terms of producing a profit. A business that is poorly 'systemized' requires more time and effort at each step to provide the product or service promised to the customer. A business with less systemization often requires more management or supervision from the owners to make sure the operation produces the desired overall result. A better business is generally more systemized requiring as little involvement by the owner as possible to create the desired results consistently over time. A business where the owner does all or nearly all of the work is not really a business so much as a self-employed situation. This is the case because the income generated or value provided to customers within the business is almost entirely dependent on the presence of the owner. A business that can produce profits without the owners involvement or with very minimal involvement from the owner behaves more like an 'investment' where the money the owner puts in is creating the majority of the return the owner gets without the requirement for hours of work. This is often referred to as 'leverage' where a small amount of input (being time, money or sweat) produces a significantly greater result. A business delivers something of greater value than it costs that business to produce, thereby leaving a profit. Dividing profit by total income tells you the margin of the business. Better businesses have higher margins. The cost of setting up the business and funding operations initially may require capital. A better business pays back the money invested to set it up to the 'shareholders' very quickly. A business that is efficient, consistent, well regarded and profitable over a longer period of time will pay returns to the shareholder(s) of the business many times the initial investment made. The more systemized a business is the less the owner may need to involve themselves and therefore the more work their money is doing for them. The business that requires the full involvement of the owner is typically classified as an 'owner-operated' business where the owner is essentially 'self-employed'. What is a Personal Training business? How can we measure a PT business's performance? A Personal Training Business can be measured in several ways. It can be assessed in terms of its ability to meet the lifestyle requirements (free time, personal development, task satisfaction, time flexibility) of the Personal Trainer whilst still meeting the profit requirements of the Personal Trainer as well. However, because the 'lifestyle' requirements change dependent on the Personal Trainer's view point the most standardized way of viewing a PT business is via its financial performance. Total income The total money collected by the Personal Trainer in a given period (usually a week or month). If you'd like to understand the use of numbers to analyze a PT business and improve its performance then you can watch a free analysis of 4 PT business cases including a commentary on each of those businesses explaining their performance and overall outlook. What affects the numbers in a Personal Training Business? Each number has several factors that affect it. New challenges, events, exercise modes which are specifically attractive to your client base given their demographics, geographics (where they live and work), and psychographics (how they think). To understand how PT businesses pass through these stages and what the numbers may look like at each stage you can watch an analysis of 4 PT business cases (each at a different stage) including a commentary on each of these businesses explaining their performance, what areas the Personal Trainer should focus on and why, and what you would want to see change in the numbers to improve results. What do I do if I want to get into the Personal Training Business? There are three steps to getting into the PT business. In this instance we are talking about getting into the PT business within a fitness club setting. This is usually done through a formal qualification of some sort that includes practical skill development in the training techniques you'll need as well as the business skills of lead generation, conversion (sales), and client care. We can not stress enough that a well-rounded qualification that includes technical and business skills is necessary if an aspiring Personal Trainer wishes to avoid losing their shirt and/or having a very slow growing business while they develop the breadth of skills they'll need to successfully run a Personal Training business. 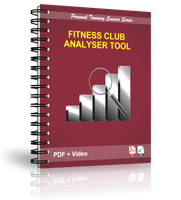 For a checklist which will step you through some of the major considerations when looking for a club use our 'fitness club analyzer tool' - you can download it for free. You need to complete a business planning process that is custom designed for Personal Trainers because Personal Trainers are in a unique situation; they promote a future result that a client invests in, they run a business that depends almost entirely on their skill base and business savvy and Personal Trainers need extremely clear action plans to quickly bring their business beyond break-even point to enable them to pay for their living expenses as well - this is usually because most Personal Trainers are very under-capitalized (read - don't have a lot of money) when they start out. We recommend this tool as a superb start to business planning for Personal Trainers. 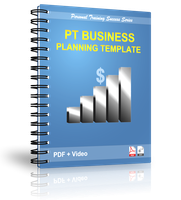 The comprehensive PT business planning template is a free download and comes with complete video instruction online as well. What should I do if I'm in the PT business and it's not looking the way I want it to? The first step in correcting a PT business is to understand the goals you have for the business. Once you understand what the numbers should look like, you can then collect your current numbers and compare. Doing this you'll quickly find where the biggest and most immediate gains can be made. Often big and immediate gains relieve the financial pressure you can be under and allow you the time to correct other things to really make your business hum. 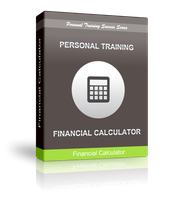 To help with step one you can download this free PT financial calculator which has been designed and refined specifically to analyse and project the financial performance of a PT business. The second step, once you know what numbers aren't looking right, is to put a plan together that focuses your energy EXCLUSIVELY on the factors that influence those numbers. We say 'exclusively' because given everything else in your Personal Training business will likely stay the same if left as it is, you can afford to focus solely on making changes to the factors that will affect your bottom line (profit line) the most. Anything that distracts you from your mission of changing the most important contributing factors is further hampering your business. Focusing your energies and attention is absolutely key. Again, if you still haven't completed a business plan but you have got some financial goals and differences clearly identified from step one, downloading your complimentary copy of the business plan template and completing it will help immensely. The third step, once you know what factors to work on to influence key numbers, is to get the exact help you need to improve as rapidly as possible. Some factors require nothing more than practise, whilst others may require you to re-think your whole attitude to an area and require some mentoring as well. Whatever is required - you'll have to be 100% honest with yourself and be completely prepared to brutally chop out any thoughts that are holding you back and take targeted actions as soon as possible. In our experience the third step is by far the most challenging for Personal Trainers and for that matter any business person who is self-employed / an owner-operator. It requires admitting things aren't quite where they need to be, letting go of comfortable habits and pushing on to take the right actions regardless of your inhibitions. Because of this requirement to change personally some Personal Trainers don't make it in the business. Contrastingly those Personal Trainers that push through become ultimately successful and incredibly wealthy with confidence because they have learned the major business lesson that when they change for the better the business changes with them. I think this single factor gives me more pleasure than anything else in writing, mentoring and coaching Personal Trainers to improve their PT business. Seeing a Personal Trainer transition from a struggling and often dis-oriented PT business situation to an incredibly secure, confident and knowing situation through their efforts and a little guidance is like watching a caterpillar morph into a butterfly. It's a truly joyful experience that if you are a struggling Personal Trainer you have the opportunity to enjoy.